You can have a lot of fun with EL3D without worrying about your score. Of course the actual landings were not scored and their success should only be measured by the magnificent achievement of each and every flight. Nevertheless, we all like to be 'measured' and have something tangible to strive for. As a result the following scoring criteria was created to enhance your EL3D experience. A NASA textbook landing was a controlled rate of descent to 100' followed by a vertical descent to the surface. How far did you drift away from the designated landing spot? The NASA criteria for a 'perfect' landing was a vertical descent from 100'. 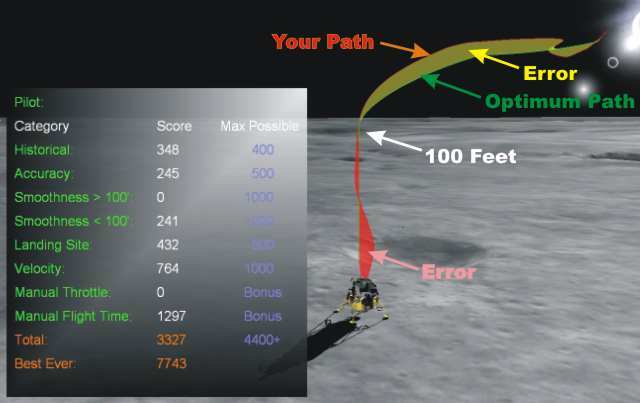 In Eagle Lander 3D the moment you hit 100' you have just determined your landing spot. It is now up to you to not drift too far from where you were at 100'. How level was the terrain you landed on? How softly did you touch down? This also includes horizontal components - not just your vertical descent rate. How close to the original landing site did you get? While this score only has 400 possible points, it does help put the 'finishing touch' on a great flight. Even though fuel reserves are marginal when doing a NASA approved landing at the original site, it is possible. How smoothly did you fly the approach? Did you make a lot of changes in your horizontal velocities and vertical descent rates? This value is based on a second order polynomial curve fit to your flight path velocities in X, Y and Z directions. The theoretical path is subtracted from your actual flight path. The closer your flight path conforms to the 'smooth' one created mathematically, the higher you score. How well did you control your horizontal rates below 100'? This value is similar to the one above except no polynomial is used - just a subtraction from "0" velocity for horizontal rates. The following picture is an annotated version of the one you can see by selecting Spot View and cycling through the displays with the space bar. Bonus is added for manual flight (Attitude Hold) and flight time in manual throttle. You can actually switch to manual flight during P64 if you wish. You must switch to manual flight before reaching 250' or you won't get a score.